Present to your beloved thisRemarkable Gourmet Treat Gift Basket for Birthday Celebrations as the symbol of your love. 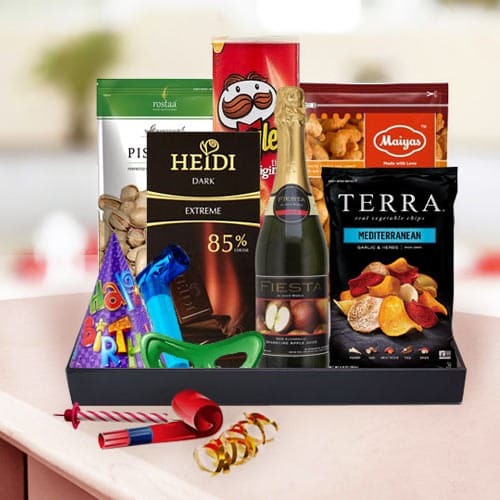 Special way to celebrate with this Birthday Gift Basket which contains Pistachio-200 gr, Masala Cashew-200 gr, Feista Sparkling Fruit Juice, Pringle Chips, Heidi Chocolate bar and Mediterranean Chips. These items are perfectly packed in a Tray with Birthday Party Accessory.